Please note, we need a physical street address to ship to and will not ship to PO Boxes or similar. We cannot be held responsible for any deliveries that are delayed or not delivered due to the incorrect information being entered at the time of order. Please double check all the information that you enter to help prevent this. If you choose this option we aim to deliver your goods within 3-5 working days either via Royal Mail 2nd Class or a courier of our choice. Whilst the majority are delivered within this time frame, it is not guaranteed. All in stock orders placed online before 1pm, Monday-Friday (excluding Bank Holidays) will be dispatched on the same day. Delivery times will depend on your location. Please ensure that you enter a complete and accurate delivery address as Prestige Tactical cannot be held responsible for items which go missing or are delayed due to inaccurate or incomplete delivery address information. Please allow up to 14 working days for completion of your return or exchange. Items should be returned in the same condition they were received together with a brief explanation of the reason for return. Please ensure that returned goods are well packed to prevent damage. All items should be returned with their original undamaged packaging. If a blister pack is opened it cannot be returned. All items with damaged packaging will be only accepted if they are faulty. Customers are responsible for the cost of returning goods to Prestige Tactical. We recommend that goods are returned by registered post. If goods are not sent by registered post, we cannot be held responsible if they do not reach us. Where goods are covered by the manufacturer’s warranty you are requested to comply with the manufacturers terms and conditions regarding that item. If an item is defective please contact us to arrange a warranty claim. * For hygiene reasons, we cannot accept returns of earpieces. Please do not remove tags and labels on clothing as once worn they are non refundable. Some products that are currently out of stock are available to order using our back order service. This option is available when we are showing nil stock and you place your order. Back order means you can still order a product and we will dispatch it to you when it comes in to stock, this is usually within 14 days. Back orders will be charged to your debit/credit card or PayPal account when you place the order, you can cancel your order and request a refund at any point up until dispatch. Back orders will be dispatched in the order they were made, the customers who ordered first will receive their products first. For safety and security reasons Prestige Tactical has deemed appropriate that to purchase this product, you must provide a Government, Police, Military, other emergency service or company address for delivery. If you feel your company has a legitimate use and should be allowed to purchase FirePens, but does not come under any of the above banners, please contact us and we will consider your purchase request. The Prestige Tactical website is owned and operated by Prestige Risks Ltd.
All of the goods on this Website are offered by Prestige Risks Ltd. which will be the contracting party for any order that you place. Any order that you place is not confirmed and subject to our acceptance. We reserve the right without reason to refuse any order. All orders placed will be subject to availability and confirmation of the order price. Some goods may only be purchased by persons of a certain age or other restriction. If we reasonably believe that you are not legally entitled to order certain goods, we reserve the right to cancel your order. We try very hard to ensure that all of the pricing information shown on our website is accurate. Rarely an error may occur and goods may be wrongly priced. If we discover there has been an error with the pricing of any item then we will contact you prior to dispatching the order to notify you of the error. You will be asked if you wish to cancel the order or to proceed with the order at the correct price. We will not be obliged to supply goods at the incorrect price. Payment for the goods and delivery charges can be made by several methods, all of which are shown on the website at the time you place your order. Payment is due before the delivery date and is a required term of this agreement, breach of which shall entitle the supplier to terminate the contract immediately. The goods you order will be delivered to the address you give when you place your order. 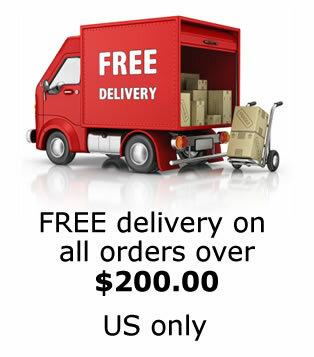 Your package will normally be dispatched on the same or next business day after cleared payment. We always confirm via email that your Item has been shipped. Where items are returned to us we will contact you and a further Postage and Handling charge will be made before items can be redelivered. Should you wish to return any of your goods, you may only do so in accordance with our returns policy.